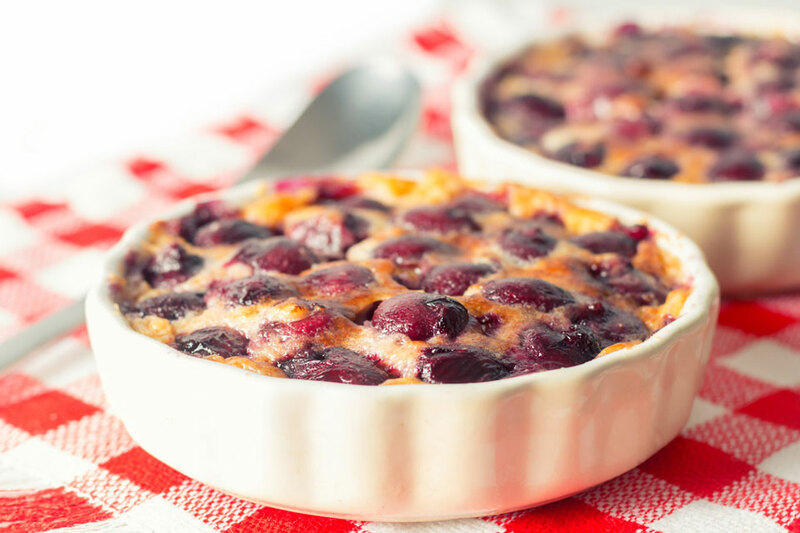 Desserts really are not my forte, I have a repertoire of hundreds of savoury recipes but not many when it comes to sweet stuff, although my Cherry Clafoutis is one that I kinda rock like a good un’. 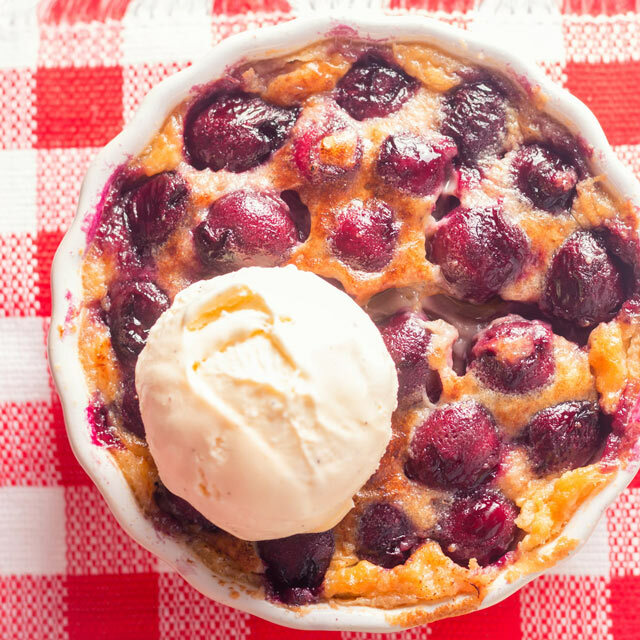 I am not too adventurous when it comes to desserts and tend to stick to fairly classical ideas with just a few twists and this Cherry Clafoutis is no different. Although rather than rocking the kirsch as the liqueur I favour Amaretto. Because lets face it cherries just love almonds and I think it adds a lovely mellow flavour. Apart from that it is a fairly classical Clafoutis, my preference for serving with vanilla ice cream would be scoffed at by those in Limousin, where the Clafoutis apparently hails. But it’s my pudding and I’ll have it as I want it. The batter or custard should be quite light and still have a little wobble when it is cooked, if you over cook it then it does have a tendency to go a little ‘hockey puck’esque’. It is not the first of my rare desserts that is inspired by our three cherry trees, I did a Cherry Bakewell last summer, yes that really is as often as I eat desserts. Thatrecipe also featured very similar flavour profiles. This recipe calls for 250g of cherries, although if you are anything like me I suggest buying at least 500g… Why, because chefs perks and all that! I am a sucker for cherries and will be found nibbling them constantly throughout the day. One of our trees is just 30m from our front door and will grab a handful everytime I take the dogs for a walk and another one when we return. Well they need using and not leaving for the starlings which seem to like them even more than I do! We often end up with far more than we can use in any sensible way, I naturally make jams and even pickle a few cherries but realistically if you have cherry trees there is always a surplus. 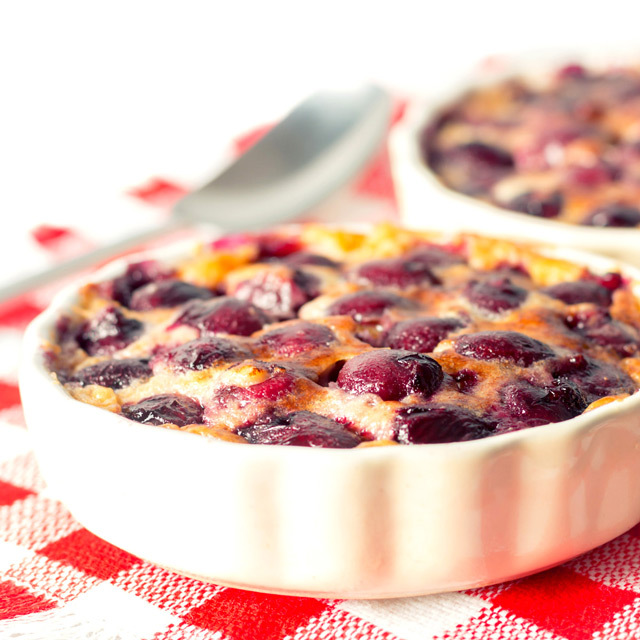 What to do with to many cherries, apart from Cherry Clafoutis of course is a major concern. I deal with it in a way that is truly fitting, turn them into wine! A simple task of crushing, pressing adding a little brewers yeast, allow to ferment and bottle, allow to sit for 6-8 months and consume. I may have lied a little when I mentioned 500g of cherries, I was actually climbing trees today collecting ingredients for todays Cherry Clafoutis recipe. That and a wee drop of Chataux Jones Cherry 2016 as my wife captured in the image below. After pitting the cherries mix them with the Amaretto and the one tablespoon of sugar and allow them to steep for a couple of hours. Now mix together the egg, sugar, milk, melted butter and vanilla essence to form a batter, I have heard of all sorts of complicated ways to do this I find, chucking in a bowl and mixing is fine a few small lumps are not an issue. I use two 12cm individual faln bowls for this dish that are about 3cm deep. Grease the bowls with butter then sprinkle with brown sugar and spin around to line the bowls with a sugary coating. Now layer in the cherries with any juice. Then pour over the batter and place in the oven for between 25-30 minutes, the batter should be cooked with just a little wobble in the centre. Far from being traditional I like to serve my Clafoutis with a scoop of vanilla ice cream, I love that hot and cold dessert 'thing'! Can you believe I have never had a clafoutis?! I know! So shameful to admit, lol! 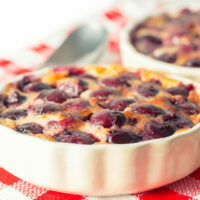 I’m so making this cherry clafoutis this year with the first cherries I see at the farmer’s market! This looks like a delicious dessert and I love the swapping of kirsch for amaretto – an inspired swap as I agree that cherries do love almonds, they are a great pairing! Wow, this dessert looks incredibly delicious! This is so cute! I would love to eat this for breakfast, lunch and dinner! Thank you for sharing this great recipe! My husband loves any kind of cherry dessert, so this might have to be our Easter Sunday dessert this year! Enjoy, this one is really superb and wonderfully simple. This looks absolutely delicious! I can’t think of anything better after a Sunday roast with a big scoop of ice cream, yum! Thanks Emily, it certainly is a good ‘un! I LOVE clafoutis. The one time I tried to make them, I totally screwed them up, but you’re giving me the courage to try again. Looks sooo good. This looks so similar to something my grandma used to make but her name wasn’t as delicious sounding…dump cake 😉 I love sweet summer cherries and just added this to my summer must make list! I have always wanted to try making a clafoutis Brian! This one looks sooo good 🙂 And I’m super jealous of your cherry tree! I have a cherry tree in my yard that’s just about ready for picking, I can’t wait to try this recipe because the list of ingredients is short and it looks delicious and easy to make! Thanks Jillian, it really is a simple but glorious recipe… I guess it has a couple of hundred years to get to a level of perfection that can not be questioned. Certainly is for us although the UK maybe 2-4 weeks behind Central Europe… So right about clafoutis, such a classic and so simple. I have never had this before, but it looks amazing with the cherries! I love that these are individual servings. 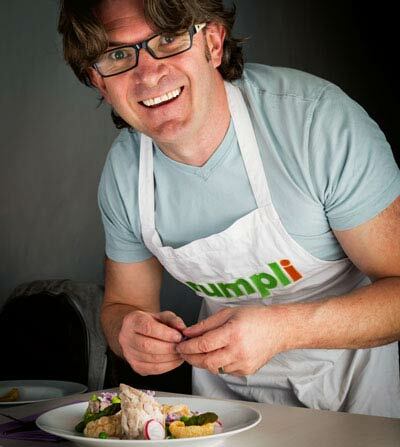 Thanks Holly, I try and do most of my desserts as single servings as we don’t eat them often so they need to be done dusted and finished on the day or they got to waste. Oh my! This looks like the perfect summer dessert – Quick and Easy. Never tried one before but am sure it’s quite a treat. YUM!